Bored of your desktop wallpaper? Check out Desktoppr, an online gallery of high quality backgrounds for your widescreen desktop. The site has an extensive collection of wallpapers and registered users can even upload their own images to the public gallery. While you may confuse Desktoppr as just another online repository of wallpapers, it does offer one unique feature – the site is Dropbox ready. You can link the wallpaper site to your Dropbox account and you will then be able to send any of the wallpapers from the site to your Dropbox with a click. The synchronization is quick and saved wallpapers will appear in your local Dropbox folder almost instantly. And it’s a two-way sync. If you add any of your own images to the app-specific wallpaper folder inside Dropbox, the images show up on the Desktoppr website for public consumption (make sure you have the necessary rights). 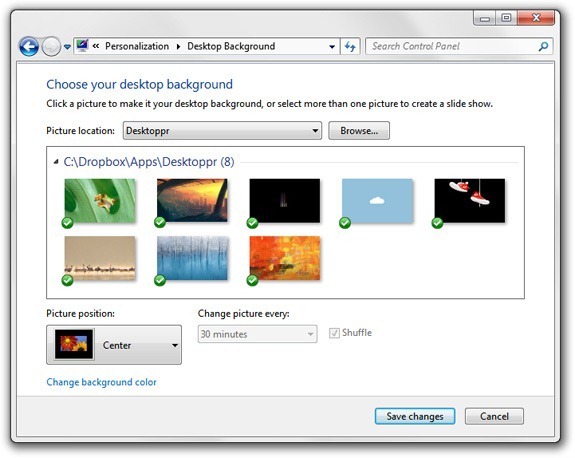 You will have to set your Dropbox wallpaper folder as the default “Picture Location” (under Control Panel –> Appearance –> Personalization) for Windows to pick up these new backgrounds (see the next screenshot). The idea is simple but clever and I wish more web apps – especially the ones around documents and photo sharing – could offer this sort of one-click integration with Dropbox.